Cooperative Learning Theory is a direct system controlled by the instructor and designed for the success of students. This is a topic suggestion on Cooperative Learning Theory from Paper Masters. Use this topic or order a custom research paper, written exactly how you need it to be. Cooperative learning is a direct system controlled by the instructor and designed for the success of students. The theory of cooperative learning is that which accomplishes an explicit goal via a teacher-centered approach. The theoretical groundwork cooperative learning is to adhere to specific structures set forth by the professor; the instructor sustains complete control of the class, albeit student interaction. Encourages students to analyze the material being studied and present to the class. According to Kagan, the role of the professor is to guide the class through controlled measures during each step of learning. Cooperative learning theory is based upon the development, assessment, and systematic solicitation of content and structure. Cooperative learning is another term used to maintain structure and social organization within the classroom. Within the classroom, structure is consistent, regardless of the subject being taught, as this model supports the use of uniformity and consistency; objectives driven solely by the teacher. Perhaps a new paradigm of instruction, however, cooperative learning theory is driven by the constructive nature of epistemology. The cooperative nature of instruction is supported by the application of continuous and consistent refinement of procedures designed to accomplish cooperative learning. Cooperative learning is group oriented, activity based learning that ensures a socially derived exchange of information is passed between the different groups and individuals within a group. An additional component of social accountability is accounted for in cooperative learning techniques because the success of the group is dependent on the individual success within each learning activity. This approach has been widely embraced within the educational system because it places more of the responsibility for the learning process onto the individual learner and the class as a whole. 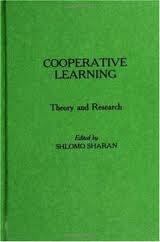 Cooperative learning theory has its roots in the collaborative learning model that reached its height in the 1990s. While in many respects essentially the same, the cooperative learning model involves more of a group operational component: “Cooperative learning refers to the instructional use of small groups in which students work together to accomplish meaningful school tasks”. Collaborative learning on the other hand, while acknowledging the benefit of the group, places its emphasis on broader group dimensions such as parents, educators, administrators, and/or members of the community. Beside the students as one dimension, there are the educators in another, and all other parties tend to be lumped together in a group collectively called the “outsiders”. While collaborative learning recognizes the need to involve the greater community as well as the students themselves in the education process it does not necessarily know which way is the most effective or efficient. Cooperative learning theory and practice solves this problem. Classroom Environment - The classroom environment is critical for educators to be at their best when providing instruction to students. Paper Masters writes custom research papers on Cooperative Learning Theory and explains the theory as a direct system controlled by the instructor and designed for the success of students.